Among the many NFL stars in Orlando for Pro Bowl week, one Seattle Seahawk is happy to be back in central Florida. 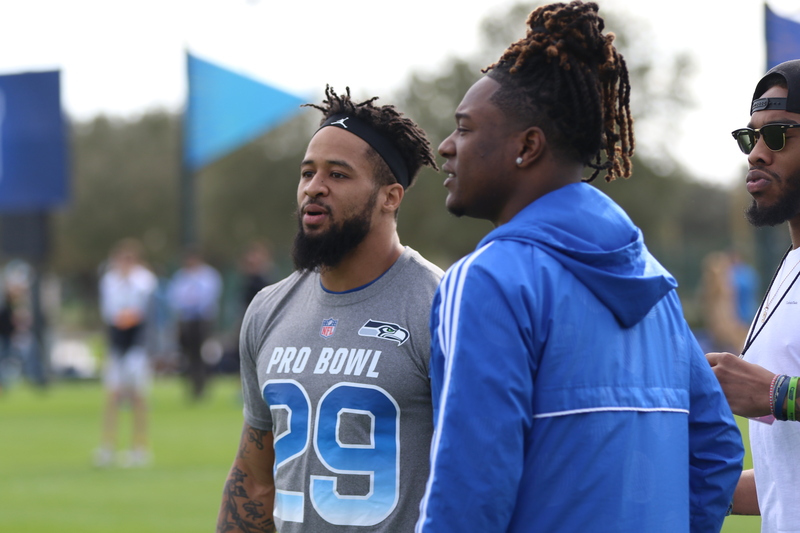 The rookie cornerback (pictured above with Seahawks safety Earl Thomas) led all Seahawks corners in passing snaps, played and started 11 games in his first NFL season. Although having to play more than Pete Carroll and the team anticipated at the beginning of the season, Griffin stepped up to the plate and proved he was capable by only allowing a 47 percent completion rate when he was the nearest defender. “The year, you know, it started off kind of bumpy but I got a chance to learn from some of the greats. It was a great opportunity to play with Richard Sherman, Kam Chancellor, Bobby Wagner, Earl Thomas and this whole great defense and get a chance to learn so much this whole year. I enjoyed every bit of it,” said Griffin. Meanwhile, his twin brother, Shaquem Griffin is currently working towards getting drafted to play in the NFL. The UCF alum said he feels “proud” of the Knights football program and their undefeated season but jokingly mentioned that he’s “jealous” of the team. “It’s awesome, I’m definitely jealous. To get a chance to go (13-0), I’m proud of them and that coaching staff and hopefully we can continue to keep that trend going with the new coaching staff we have now. I’m so proud of them,” Griffin said. And as for UCF’s bold national championship claims? Shaquill agrees with it. This past week in Alabama, Shaquem told reporters that he will call UCF national “over and over again”. “That’s definitely my mindset. You know, I’m alumni there and I’m going to be screaming national champs until I die so I’ll be saying it with him (Shaquem),” said Griffin.